They range in size and shape, and can be found all over the world, where variations have been made to the original design as they adapt to different cuisines, uses, and conditions. Most modern Dutch ovens are made to be used in outdoor camp settings. They are made of thick cast iron, have three sturdy legs to rest above coals, a heavy lid with a ridge to hold the coals, and a wire bail. 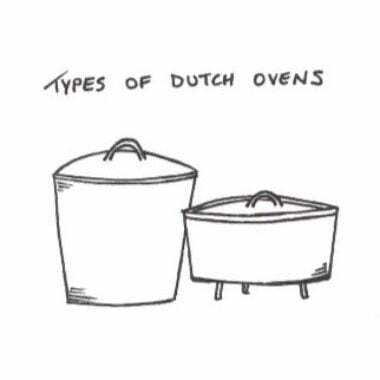 Dutch ovens can still be found indoors. These are made to be used in modern ovens and on modern stovetops. They are made of cast iron and may be seasoned or have an enamel coating. They have flat bottoms that can be placed on top of wood, electric, or gas burners. Their tops are curved, as holding coals is not a consideration. The Australian version of a Dutch oven is a spun steel cooking pot with a unique shape that differs from the traditional Dutch oven. The bottom, top, and sides are far flatter than other variations and the lid doesn’t seal like other designs. Rather, it has a large lip which covers the main pot, traveling down the sides of the pot. This shape also allows the lid to act as a frying pan. Named after the town Bedourie, in Queensland, these ovens are a more rugged alternative to the sometimes perceived fragile cast iron, which is prone to cracking if dropped. The lighter weight solution is also more in line with the independent characteristics of the Australian bushmen and stockmen. An issue with the spun steel solution worth remembering is that this construction make is more prone to hot spots. Similar in appearance to a cauldron, the South African potjie, or “little pot,” has a round bottom and a wire handle for suspending the pot over a fire. This cast iron pot is reinforced with external circumscribing ribs and a lid with a convex contour, so that hot coals can lie on top. With three short legs for resting, the pot can be heated from both below and on top. Shaped a little like a vase or pot, with a narrow top and large bulbous bottom, the chungun has no legs or handles. This often means a long-handled holding tool is used as a roller or scoop to help lift the chungun in and out of the oven. The chungun is used in Eastern Europe, particularly Russia and Central Asia. Unlike the Dutch oven, the chungun not having feet to heat it above coals, means it is often heated inside a traditional oven or hearth, with potentially many pots stacked on top of each other to cook a single meal. The bean pot has a flat bottom with no legs, because of the primary way it is used. A bean pot can be hung over a fire to boil beans, or another common method is to bury it in hot coals. Neither of these methods need legs, a flat lid, or a coal rim. The lid is often domed and has little nodes distributed across the top of the inside. These nodes are used to manage the condensation that is created in the pot and how it drips back into the pot for basting. This design is most similar to the original English Dutch oven, before it was modified for camping (with the legs and rims to manage the coals and ash). Although camping versions are almost always made of cast iron, some are made of clay or ceramics. The Dutch braapan must be mentioned as its design and casting methods from the early 1700’s is the origin of what the typical Dutch oven is today. Modern baapans are a variation on the original, with the metal being cast iron or plate iron, almost always covered with enamel. These modern versions are lighter and cheaper than some of their relations, most closely resembling the modern casserole dish, and not used in outdoor or live fire cooking. The tetsunabe (鉄鍋) are a Japanese version of a Dutch oven: a cast iron pot that is used for stews and soups. These are closely related to ‘donabe’ (土鍋),” which is a thick clay version. Both pots are well admired for their ability to keep the contents warm after being removed from the fire. They are served in the center of the table to share among the people eating. The ultimate Dutch oven is a modern variation that has a central element, that almost creates a bunt ban type-shaped pot. This design offers a new and potentially more efficient method to cook a variety of foods. It works well with both savory dishes and sweet dishes, including breads and cakes. 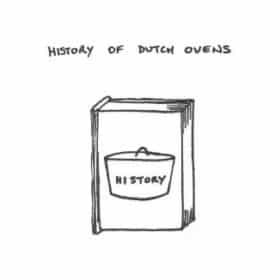 The Dutch Oven’s history can best be summarized in three distinct moments in History. These events are all key steps in creating the modern-day Dutch oven.